I have tonight lit the candles in the lounge for the first time since about May and started stitching for this year’s Autumn exchange piece so I am now declaring Autumn officially here. Along with the excessive rain that we have had this week (not that in Yorkshire that distinguishes Autumn from Spring, Summer or Winter :-)) Is there an official start to Autumn ? It seems to have come pretty early this year or maybe I have been too busy waiting for Summer to arrive properly and in my confusion lost track of time. Not that I mind Autumn at all – it is in fact one of my favourite seasons, I love snuggling up at home after being away lots in Summer, and watching my candles flicker, preparing for Christmas (mind you I have been making ornies all year!) and meeting all my new students for the year (the first lot arrive on Monday!). But I do like Winter as well (except when the snow is really bad though I am better with my snow paranoia now that I realise that the children are grown up and we can all get supplies in and we are not going to get cut off!) And I love Spring because that is when the teaching winds down and my garden looks lovely and I can start having BBQs again. And I love Summer when we can go camping and do re-enactment events. I just love all the seasons for different things and am very happy to be able to enjoy so much. I am feeling very, very happy at the moment, not for any particular reason but just very relaxed after a busy year so far, I have been doing lots of work on the house which is nearly at an end, we have been here nearly 6 years now so lots of things needed freshening up. There have been lots of changes at work – higher education is in a bit of an upheaval at the moment to say the least but we are looking forward to a great year ahead. I am very lucky, I have a job I really enjoy, two wonderful kids, lots of friends and a really nice life and I am very thankful every day to be here and having such a lovely time – even if I have got quite wet this week! I have finished two more Xmas ornies this week , one of these has been on the go since my last trip to Spain and the other I completed most of on my train trips down to Worcester and back last week. 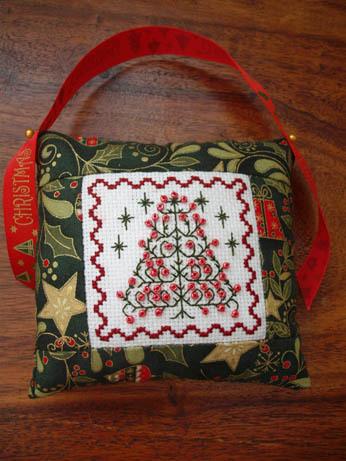 The one is another version of the JBW Christmas Motif Sampler tree – did not realise I had already stitched this one until I checked my blog posts under the ‘Xmas ornies’ tag to see how many I had done but you can never have too many ornies can you? For this I used some variegated thread that I bought at the Malvern Quilt Show – only one strand was needed as it was quite thick and it stitched up really fast. 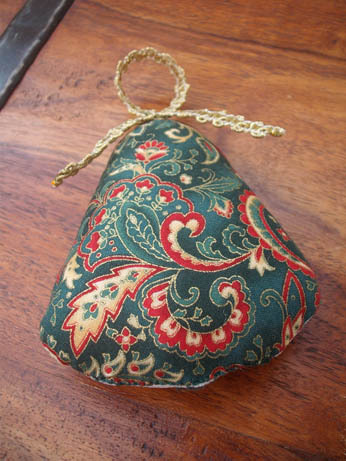 I am not certain what the backing fabric is – I have had this in my stash for quite a while. 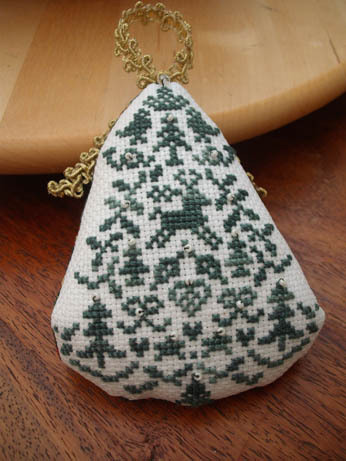 The other pattern is an old one from the Gift of Stitch magazine called Red Berries by Rosewood Manor , I made this for my Mum some years ago and always wanted one for me. 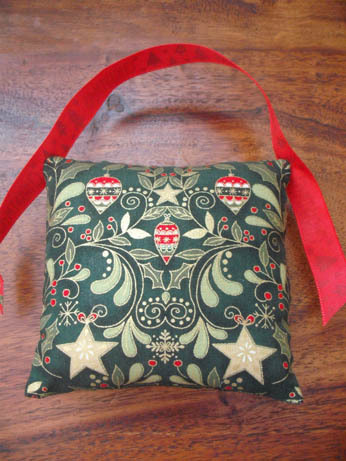 I finished this as a little pillow and I am really pleased with the way the fabric complements the stitching – this is some of the fabric I got at Malvern and I think it looks fab. The fabric is called Joyful 2 by Makower and you can get it online from The Cotton Patch It may be a bit big to hang on the tree but I can find somewhere for it. 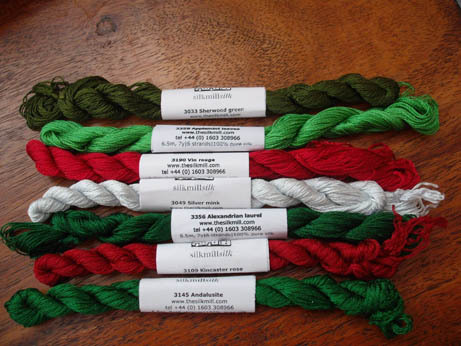 I also had my delivery from The Silk Mill – look at all these lovely Xmas colours! I love using silk thread for my stitching as it is so nice to work with and has such a beautiful sheen. It does cost about twice as much as stranded cotton but I usually buy the Silk Mill sets which are good value and am building up my stock of colours gradually. I do need to get a serious move on with the rest of my Xmas ornie making as the WI are having a stall at a local Xmas craft fair which I have volunteered to do as well as the Oakwell Hall one I had planned and both of those are on the same weekend. I would like to do another local school one but don’t know if I will have enough time to make stock for 3. It’s the little matter of the day job taking up so much time! Here’s hoping for a little respite in the rain this weekend so that I can do my gardening! The end of a busy week….and then there was embroidery! Love all your Christmas ornies and threads Alison. Oh dear — Christmas will be here before we know it, won’t it? Your ornaments are very cute. I love what you said about the seasons — I’m like you — I love them all for different reasons. I could never retire to a warm place like so many people do — I would miss winter too much! Oh I could retire to Spain and just visit with pleasure – just a couple of weeks of Autumn and Winter each year would be enough and Christmas in Spain is fab, lots of traditional festivities and a picnic on the beach.I don’t like it too hot but too cold plays havoc with my old bones!